A two-stage SpaceX Falcon 9 rocket lit up the early-morning Florida sky as it launched the company's robotic Dragon capsule toward the International Space Station (ISS) on a delivery mission for NASA at 5:42 a.m. EDT (0942 GMT) from Cape Canaveral Air Force Station. It will arrive at the space station early Monday (July 2). The liftoff was the second for both the Dragon and the Falcon 9's first stage; the capsule previously visited the ISS in July 2016, and the booster helped launch NASA's Transiting Exoplanet Survey Satellite this past April. The 10-week turnaround was the shortest ever for a landed and relaunched SpaceX first stage, company representatives said. SpaceX did not attempt today to land the booster for a second time. The booster is a "Block 4" Falcon 9 variant, which SpaceX is phasing out in favor of the recently debuted "Block 5." So, the company surrendered the first stage to the ocean. In fact, today marked the last-ever flight of a Block 4 Falcon 9, SpaceX representatives said. To date, SpaceX has pulled off 25 first-stage touchdowns and reflown 14 such landed boosters. These activities are in service of the company's ambitious long-term vision. "From the get-go, SpaceX has set out to make spaceflight more like commercial air travel — we want to make it safe [and] affordable and [to do it] utilizing vehicles that can be reflown repeatedly," Jessica Jensen, SpaceX's director of Dragon mission management, said during a prelaunch news conference yesterday (June 28). "This the key to the future of a civilization where we have thousands to millions of people exploring the stars and living out on other planets," she added. More than half of that stuff — 3,874 lbs. (1,757 kg), to be exact — is scientific gear, NASA officials said during yesterday's press conference. One prominent piece of that research equipment is NASA's Ecosystem Spaceborne Thermal Radiometer Experiment on Space Station (ECOSTRESS) instrument, which will measure the temperature of vegetation around Earth with a precision of just a few tenths of a degree. ECOSTRESS' observations will help scientists understand how plants respond to heat stress and lack of water, NASA officials said. The sharp-eyed instrument will also help keep tabs on urban heat waves, volcanic activity and wildfires. "We'll be able to see a bonfire on a beach," ECOSTRESS principal investigator Simon Hook, of NASA's Jet Propulsion Laboratory in Pasadena, California, said in a statement. Also aboard Dragon is an experiment designed to determine if microgravity-cultured cells can serve as a model system to assess the effectiveness of certain cancer-treatment drugs. Another investigation aims to engineer algae for growth in microgravity. "The cultivation of algae offers potential as a system for recycling carbon dioxide, which is one of the things we need in our life-support systems," David Brady, NASA's assistant program scientist for ISS, said during yesterday's news conference. "And it also potentially could provide food for crewmembers on long space voyages." Then there's the Crew Interactive Mobile Companion (CIMON), a joint effort of the German space agency (known by its German acronym, DLR) and Netherlands-based aerospace company Airbus. The nearly spherical, 11-lb. (5 kg) CIMON is an astronaut assistant endowed with artificial intelligence that can see, hear and talk. Its main mission aboard the ISS involves demonstrating "cooperation between humans and intelligent machines in the form of a technology experiment," DLR officials wrote in a description of the project. Dragon will stay attached to the ISS for a month, eventually returning to Earth for an ocean splashdown (and subsequent recovery by ship) on Aug. 2. Dragon — the only currently operational ISS cargo craft designed to survive the fiery voyage through Earth's atmosphere — will haul 2,860 lbs. (1,297 kg) of science gear during its return trip, Brady said. But Dragon 2's resupply flights will still be robotic, Jensen said. "What we'll basically be doing is changing out seats and consoles for cargo accommodation," she said. Photo courtesy of Denise Drylewicz. The world's newest spaceplane -- the Boeing Phantom Express, just completed a major development milestone. The Phantom Express is designed to launch itself into space and return to Earth with responsive, 24-hour turnaround capabilities. Prior launch vehicles needed months of preparation between launches -- the Phantom Express's turnaround time between launches will be less than 24 hours. Launching the Phantom Express will also be a bargain compared to the costs to launch traditional rockets. The Phantom Express will be able to make frequent 3,000-pound deliveries to low-earth orbit more affordably, an ideal solution for military and commercial purposes. 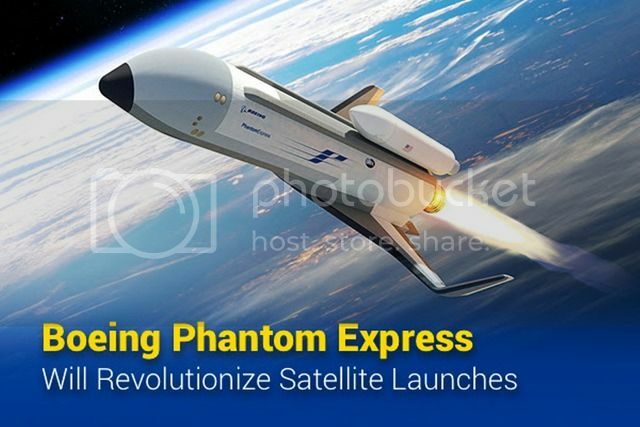 The Phantom Express will increase the speed and lower the price tag of delivering items to space. SpaceX successfully launched a Falcon 9 rocket with the Telstar 18V communications satellite onboard this morning. Liftoff took place at 04:45 UTC, September 10th 2018 from Space Launch Complex 40 at Cape Canaveral in Florida. The first stage of the Falcon 9 shortly after landed on the Autonomous Spaceport Drone Ship (ASDS) out in the Atlantic Ocean. NASA and Roscosmous attempted to send two new crew members to the ISS aboard a Russian Soyuz spacecraft early this morning (Oct. 11). The attempt went very wrong. But NASA TV reports that astronaut Nick Hague and Alexey Ovchinin are "in good condition" after a booster problem resulted in their Soyuz spacecraft making an unexpected, sharp return to Earth. As of 6:09 a.m. ET, NASA representative Brandi Dean reported on NASA TV that, according to Russian officials, search and rescue teams had reached the crew and that they had emerged from the unexpectedly downed capsule. Search and rescue teams were reportedly "working with them to get them ready to leave." Earlier, just minutes after the 4:40 a.m. ET launch, a problem occurred with one of the boosters carrying the Soyuz capsule to space from its launch site in Kazakhstan. That led to the Soyuz falling back to Earth in what NASA termed "ballistic descent mode" at "a sharper angle than we would try to land via." Nonetheless, by 5:20 a.m., Dean had reported over NASA TV that the crew had made contact with a search and rescue team and were, at least according to Russian sources, "in good condition." Dean has repeated that precise wording several times. On April 19, 2008, a Russian Soyuz returned from a successful trip to the ISS in much rougher fashion than usual. The crew of three went through a descent that NASA similarly described as a ballistic trajectory. In similar fashion to what NASA described today, the spacecraft entered the atmosphere at a steeper angle than typically intended, in what Live Science sister site Space.com reported was an "uncontrolled spin." That descent subjected NASA's Peggy Whitson, Russian cosmonaut Yuri Malenchenko, and South Korean astronaut So-yeon Yi to more intense g-forces than usual and deposited them safely but far afield of their intended landing site. Then as now, however, NASA emphasized that the landing itself wasn't out of control, but rather it was one of several backup modes that crews train for and for which the spacecraft is designed. 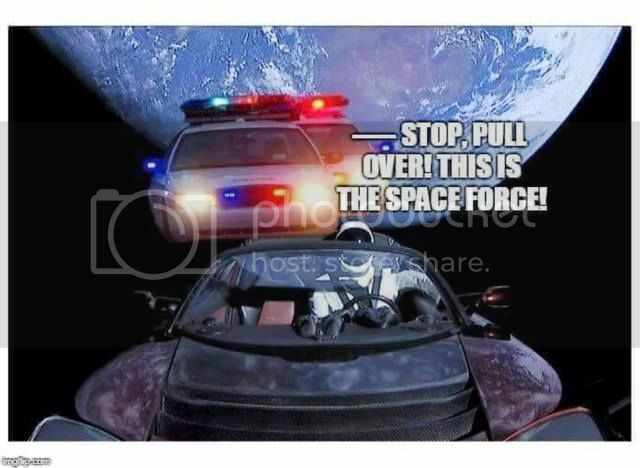 In an interview later published on NASA's website, astronaut Alexander Kaleri, who was not part of the crew, said of that ballistic descent, "This was not a failure, as you understand; it was not a failure per se, it was one of the possible modes of descent." These sort of landings used to be the norm, and in fact expected, in the early days of spaceflight. As Florida Today reported in 2008, in the early 1960s, Mercury astronauts and Vostok cosmonauts used the atmospheric drag of ballistic trajectories to slow their spacecraft enough to safely deploy parachutes. Now, however, Soyuz enters such a trajectory only as a backup when other systems have failed. And the experience can be dramatic; Whitson reported reading 8.2 gs "on the meter" during her ballistic descent. That means she and her crew were subjected to forces 8.2 times the strength of Earth's gravity. 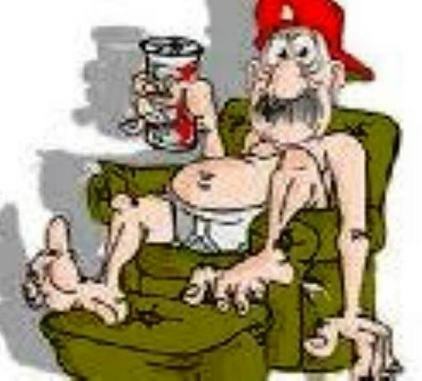 In that environment, a 150-pound (68 kilograms) person would feel as though they weighed 1,230 pounds (558 kg). The last time a Soyuz mission was aborted was Sept. 26, 1983, when a rocket became engulfed in flames on the launchpad more than a minute before launch. Crew members fired emergency rockets close to the last possible moment, ejecting the crew vehicle to safety. It’s fair to say that 2018 was a rather wonderful year for space. We saw SpaceX’s Falcon Heavy lift off for the first time, a new European mission launch to Mercury, Japanese rovers land on an asteroid, and more. But if you thought 2018 was great, you're in for a treat. Because 2019 has got a whole host of incredible missions and launches in store for us, and the action begins straight away. So let’s take a look at some the exciting space events coming up in the next 12 months. From human launches to scientific missions in the Solar System, there's plenty to look forward to. The year gets off to an incredible start on January 1 when NASA’s New Horizons spacecraft arrives at the distant Solar System object Ultima Thule, the furthest object we’ve ever visited in the Solar System. The first high-resolution images will arrive back on New Year’s Day, but it’ll take 20 months for all the data to be sent back to Earth. By January 3, we are expecting to China to attempt a landing of its Chang’e 4 rover on the far side of the Moon. This is the first mission ever to the Moon’s far side. On January 17, SpaceX is scheduled to launch its crewed Dragon 2 spacecraft on its first test flight, dubbed Demonstration Mission 1 (DM-1). There won’t be any crew on this fight, but SpaceX hopes to launch its first humans in the summer. India hopes to launch a lander and rover to the Moon on January 31, called Chandrayaan-2. It will attempt to visit the south pole of the Moon for the first time in history. By early February, NASA's InSight lander should begin drilling into the surface of Mars. It'll hammer sensors up to five meters (16 feet) into the ground to measure the temperature inside the Red Planet. NASA's Juno spacecraft will perform five close flybys of Jupiter in 2019 – on February 12, April 6, May 29, July 21, and September 11. On February 13, a SpaceX Falcon 9 rocket is scheduled to take a lunar lander built by Israeli company SpaceIL to the Moon. Originally part of the canceled Google Lunar XPRIZE, SpaceIL is now hoping to make it to the Moon alone. At some point as early as February, Japan’s Hayabusa-2 spacecraft will descend to the surface of the asteroid Ryugu to try and collect a sample. Boeing will conduct an uncrewed test flight of its CST-100 Starliner vehicle at some point in March, with plans for a first crewed test in August. SpaceX is scheduled to launch its second Falcon Heavy rocket in March, the launch of the Arabsat-6A spacecraft for Saudi Arabia. NASA’s Parker Solar Probe will make its next close approach to the Sun on April 4. After that, the next closest approaches are on September 1 and December 26. By April, Elon Musk says that SpaceX will perform a test flight of its Starship vehicle, intended to one day take humans to Mars. By early 2019, Richard Branson’s Virgin Orbit company plans to send its first rocket to space. Also in early 2019, we’re expecting a third Falcon Heavy launch, this time taking a variety of military and scientific satellites into orbit, including some from NASA. In June, we are expecting to see the first crewed launch of SpaceX’s Dragon 2 vehicle from Cape Canaveral in Florida. This will be the first launch of astronauts from US soil since the final Space Shuttle flight on July 8, 2011. On board will be NASA astronauts Bob Behnken and Douglas Hurley, both on their third spaceflight. We’re also expecting a possible first crewed flight from Blue Origin at some point in the first half of 2019. And following their first flight to “space” on December 13, Virgin Galactic could very well take its first paying customers to space in the first half of 2019 after further testing. Here’s a bonus astronomy event for you. A total solar eclipse will be visible from South America, including Chile, on July 2. And set your calendars for July 20 because that will be the 50th anniversary of Apollo 11, the first mission to land humans on the Moon. We could see the first contract crew flight of SpaceX’s Dragon 2 in August, providing the test flight sticks to schedule. This is called USCV-1, and it’ll be taking astronauts Mike Hopkins and Victor Glover to the International Space Station (ISS). NASA’s OSIRIS-Rex spacecraft will swoop down to the surface of the asteroid Bennu in September and try to collect a sample. It will return to Earth with this sample in 2023. A new planet-hunting mission from ESA will launch between October 15 and November 14. It’s called CHEOPS (Characterising Exoplanets Satellite), and it’ll look for planets orbiting bright stars close to our Solar System. Another astronomy one for you. On November 11, Mercury will transit the Sun as viewed from Earth. Japan’s Hayabusa-2 spacecraft will depart the asteroid Ryugu in December, returning it to Earth in December 2020. And finally, by the end of the year, we’re expecting China to launch a sample-return mission called Chang’e 5 to the Moon. No launch date has been revealed yet – but it could bring to a close a rather impressive year for space. I will NOT be watching at 2:49AM Saturday. Watch if you wish! 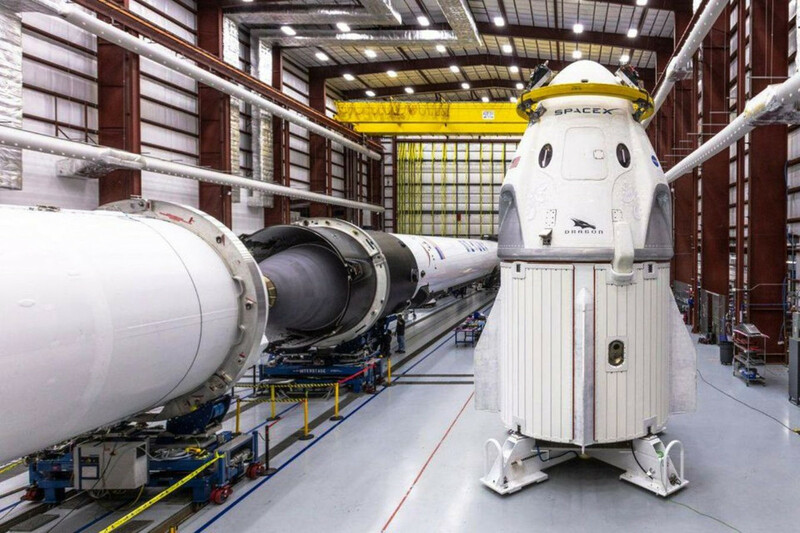 SpaceX is counting down to the March 2 launch of the company's first-ever Crew Dragon spacecraft, and it looks like Mother Nature may cooperate. The weather forecast for SpaceX's Demo-1 Crew Dragon test flight predicts an 80 percent chance of good conditions for the pre-dawn launch this weekend. Liftoff is scheduled for 2:49 a.m. EST (0749 GMT) on Saturday. "Weak high pressure in advance of a front moving southeast into the area is expected during the launch window with a low probability for rain and weak surface winds and only slight concerns of any cumulus cloud or thick cloud rule violations during the instantaneous launch window," NASA officials wrote in a status update Tuesday (Feb. 26). If SpaceX cannot launch the Crew Dragon on Saturday, a backup date is available on March 5. But the weather forecast worsens for that day, with just a 40 percent chance of good conditions, according to a report from the 45th Weather Squadron at the nearby Cape Canaveral Air Force Station. from U.S. soil since NASA's space shuttle fleet retired in 2011. SpaceX is one of two companies NASA has tapped to fly astronauts to the station under the agency's Commercial Crew Program. The other company, Boeing, plans to launch the first uncrewed test flight of its own CST-100 Starliner spacecraft in April. NASA has been dependent on Russia's Soyuz spacecraft for crewed flights since the shuttle fleet retired. If all goes well on the Demo-1 mission, Crew Dragon will launch early Saturday and dock itself at the space station in the wee hours of Sunday (March 3), where astronauts are eagerly awaiting the new arrival. "Astronauts Anne McClain and David Saint-Jacques will monitor the Crew Dragon’s approach and rendezvous on Sunday," NASA official wrote in a crew status update Tuesday. "The vehicle is targeting a 6 a.m. EST docking to the [International Docking Adapter], where the hatches will swing open about two-and-a-half hours later." Crew Dragon will deliver 400 lbs. (181 kilograms) of supplies to the station and one "anthropomorphic test dummy," a spacesuit-clad mock astronaut equipped with sensors to record what the trip will be like for human space travelers, SpaceX and NASA officials have said. The mission will end with Crew Dragon undocking and returning to Earth on Friday (March 8), with a splashdown in the Atlantic Ocean just off the eastern coast of Florida, NASA officials said last week. Visit Space.com this week for complete coverage of SpaceX's Demo-1 Crew Dragon flight to the space station. It happened at Plesetsk Cosmodrome. It wasn't until three years after the explosion happened that the Soviets admitted that this secret spaceport existed. They continued to keep the deadly explosion a secret until 1989. State officials blamed the explosion on human error. But a later investigation determined the cause to be a design flaw with the rocket.